The ultimate video solution tailored for the most challenging projects. 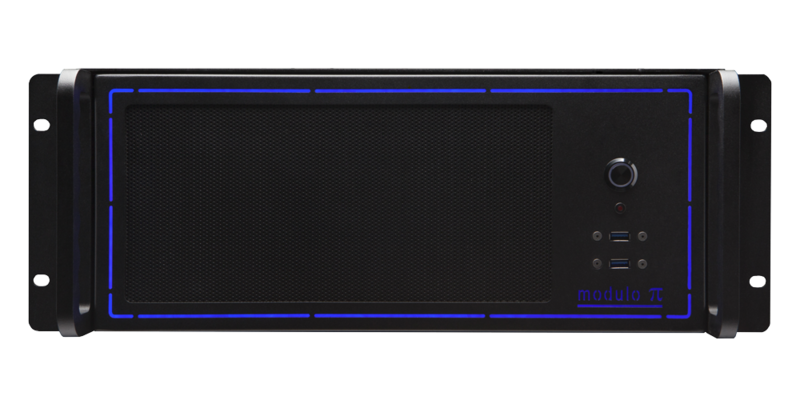 Modulo Kinetic is a super high-end and fully-integrated media server which will be the cornerstone of your complete workflow. 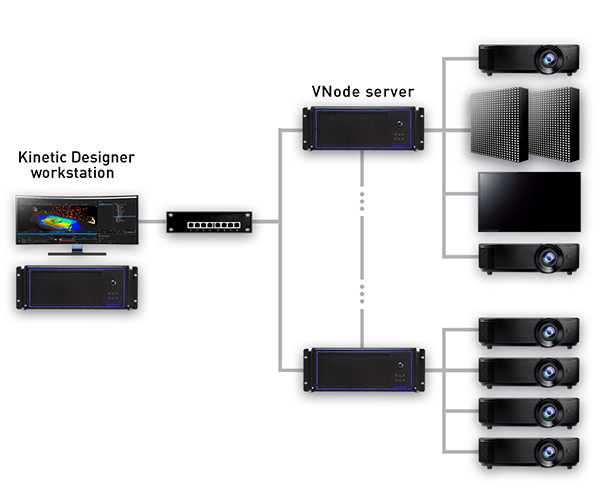 Perform study, simulation, show creation, encoding, playback and control … all of it through one single box. With its intuitive user interface and advances innovative features, Modulo Kinetic offers unprecedented real-time 3D, interactivity, and tracking. we created Modulo Kinetic to help you every step of the way. and effortlessly create stunning visual experiences. Modulo Kinetic brings together the most advanced tools within one consistent environment. The platform relies on Kinetic Designer, a powerful user interface with a dedicated workstation, connected to one or several VNode media servers. Kinetic Designer can be used offline for show study, simulation, and pre-encoding. When connected to the VNode media servers, Kinetic Designer will automatically distribute the media content to the VNode servers on the network. Kinetic Designer has been designed to make sure users focus on what’s important. Available offline and with multi-user capabilities, Kinetic Designer is the perfect tool for artists, designers, project managers and technicians. Modulo Kinetic is built to process media seamlessly and provide the best image quality, while running on a streamlined hardware configuration. It handles a wide array of formats including Apple ProRes, HAP up to 8K+, uncompressed sequences including 10-bit DPX, as well as Interactive Shader Format (ISF). Modulo Kinetic’s 2D compositing tool is easy and fast to learn. 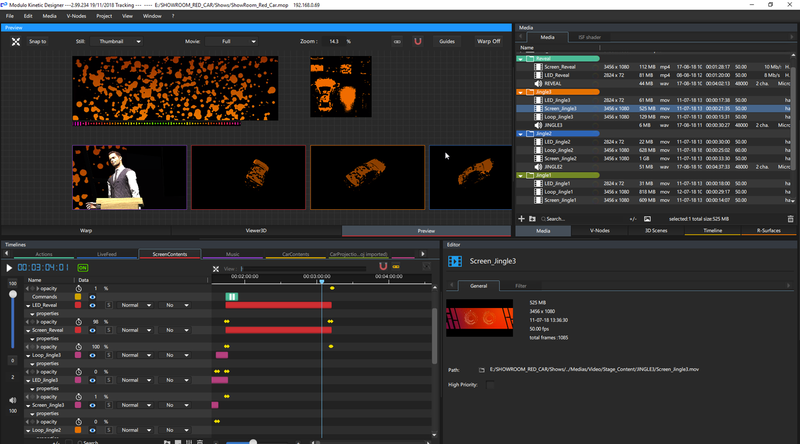 A timeline sequencer allows to organize and animate your media, while the preview panel offers real-time visualization of your render surfaces and composited media. Create unlimited, non-linear, real-time timelines. Drag & drop media, 3D scenes, add effects and keyframe animations. Add control cue, trigger tasks, control devices directly to the timelines. Create as many Render Surfaces as needed. Those can be used to map a 3D object or to project content from a virtual projector in a 3D environment. Drag & drop cameras/projectors from the 3D scene in your timeline. 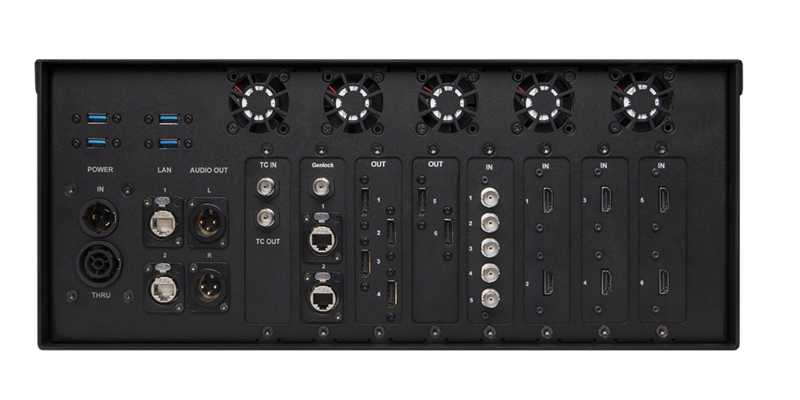 Modulo Kinetic is a multi-user device: several operators can work simultaneously on the media server and mixer interfaces. All contents and operations are perfectly synchronized. Modulo Kinetic integrates live input cards, including FLEX video I/O technology by Deltacast. Find more information in Modulo Kinetic’s brochure. Warp your outputs with the keystone or curve features which come with many tools all embedded in Modulo Kinetic to make the process fast and easy. 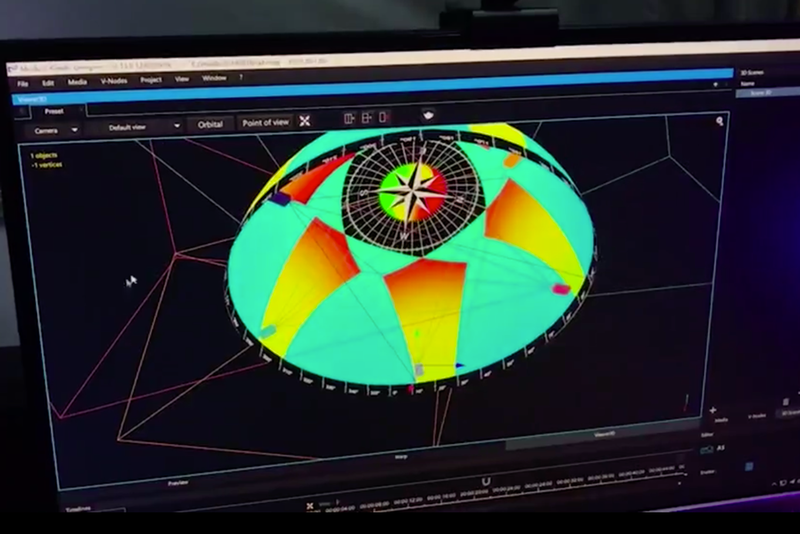 Our exclusive X-Map function is the ideal tool to perform video mapping on the most elaborate shapes. Simply import a Photoshop file, extract each of its layers, and warp them independently. Auto calibrate your projectors in a 3D scene with 2D-3D connection points. A multi-user warp remote, which can run on a simple laptop, is available for the 2D warping or 3D calibration process. Several operators can work together simultaneously to speed up the calibration process. Our 3D workflow features a real-time 3D scene visualizer. There you can create unlimited number of scenes, add objects from our internal object library, and work with them (position, rotation, resize). You can also import objects in a wide range of formats, or import complete scenes including lights, cameras, animations, or point cloud files from professional 3D scanners. Use Modulo Kinetic to create your own animations. You can also import some existing animations, and modify them in the included animation editor. 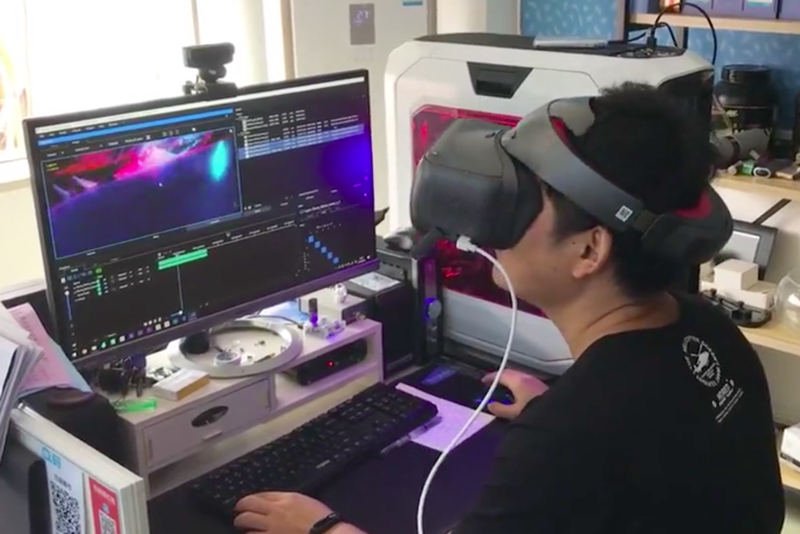 Modulo Kinetic makes real-time VR easy for improved show study and simulation: one single button in the user interface allows to visualize a show scene from any angle with a VR headset. No coding is needed to enjoy all the benefits of Modulo Kinetic’s real-time interactive VR. 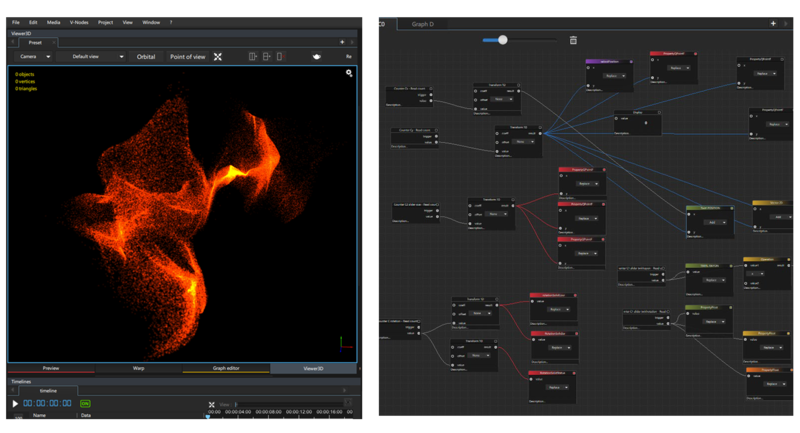 A powerful 3D particules engine offers real-time generative and interactive content. Particles can be created, modified, and animated directly in Modulo Kinetic’s user interface to produce spectacular effects. To optimize performance and usability, Modulo Pi has developed its own tracking system. 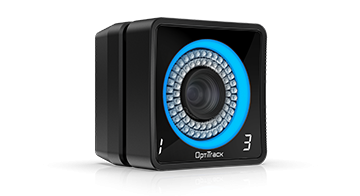 The optical tracking module allows real-time projection on moving objects, interaction with 3D scenes (including particles), and sending beacon position to light desk using the PosiStage protocol (PSN). Watch our demo video to find out more about Modulo Kinetic’s advanced tracking capabilities. Create, control, and play automated tasks for a large number of preloaded external devices including video-projectors, matrix switchers, video processors. 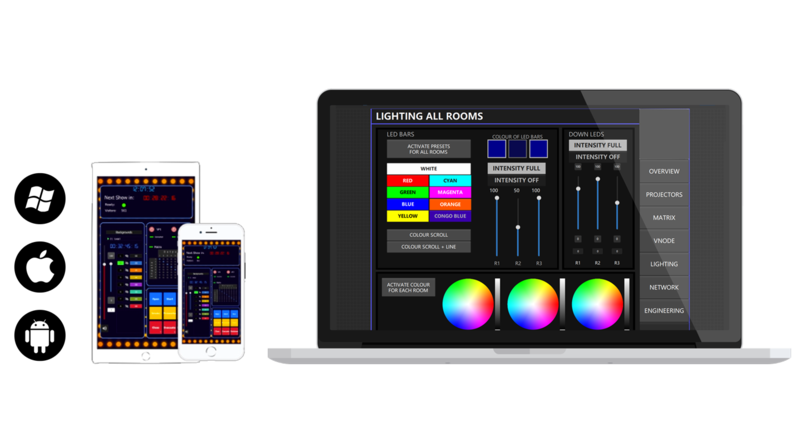 Trigger tasks from specific devices such as Calendar, MIDI, OSC, GPIO, DMX through Art-Net. Easily create custom user panels working through Modulo Kinetic’s UI Designer: drag-and-drop tasks, add buttons, texts, images, web pages etc. Each custom user interface can be protected with a user login and password. A new ruggedized suspended chassis is now available as an option.